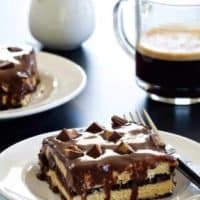 Peanut Butter Cup Eclair Cake is so easy, and NO-BAKE! Layers and layers of chocolate, peanut butter and cream will make this dessert a summer favorite for years to come. 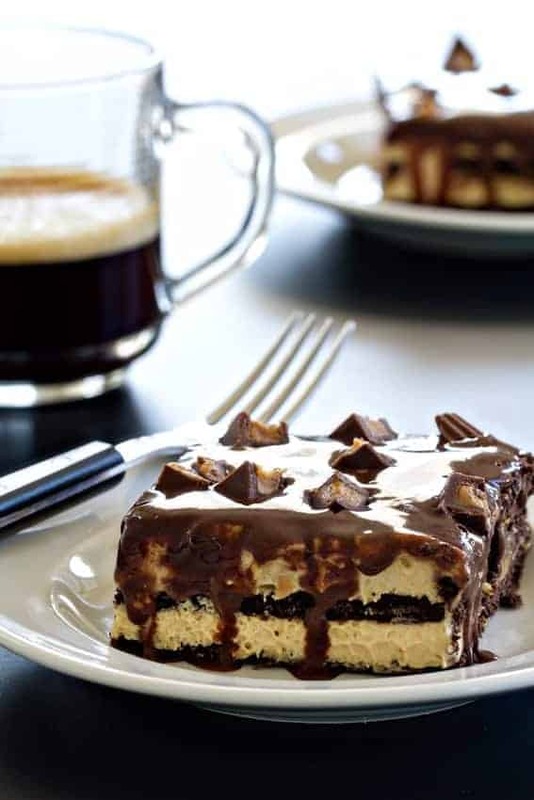 I do love an eclair cake. I’ve been making them for years, and definitely made this Cookies and Cream Eclair Cake about five times last summer. It may have started out as a way to purposely get leftover peanut butter cups out of my house before I devoured them single-handedly, but this cake has turned out to be an amazing addition to our summer dessert repertoire. A bit ago, I made Karly’s Peanut Butter Cup Pancakes. And whoa baby, are they good. They have one flaw, if we’re going to call it a flaw. We like to buy things in excess around here, so we had an entire bag of those new Reese’s Minis Unwrapped Peanut Butter Cups leftover. They were calling to me when I walked by. Haunting me when I tried to eat a salad. This would simply not do, friends. I have a hard enough time trying to resist all the Ghirardelli baking chips hanging out in there, having a party of their own. Add peanut butter to the mix? I’m in trouble. Serious trouble. I decided the only thing to do was put them in a dessert that I wouldn’t dare finish all by myself. It’s self-preservation, really. Now that we live so close to family, folks are always stopping by to visit. We love it. Since we’re both home with Elle, we get to see her relationships with our extended family grow and grow. But you better believe that when you have a baking and dessert website as your J-O-B, people expect to be treated to delicious things when they walk through my door. And I wouldn’t have it any other way. So I made this delectable no-bake icebox cake, a Peanut Butter Cup Eclair Cake, that solved two problems. First, it got rid of those hauntingly scrumptious mini peanut butter cups. Second, this fabulous cake stores in the freezer for weeks. Every time someone stopped by, all Eric or I had to do was pull the foil-wrapped cake out of the freezer, slice some pieces off, and wait for them to thaw on the counter a bit while coffee was made, water was offered, and Elle got snuggles. This is the perfect entertaining cake. Sure, you can make it ahead of time and take it along to a barbecue, where it’ll feed a big ol’ crowd. But you can also keep it handy for when guests drop by – or a super mega peanut butter craving hits. Not that that ever happens to me. I heard about it from a friend. I mean it, guys. This cake is for you if you love having something on standby for drop-in guests. With simple ingredients like chocolate grahams and Cool Whip or TruWhip, you’ll have it put together in minutes. Then just let it set up in the fridge overnight before serving or popping it directly into the freezer. Next time the doorbell rings, you’ll be ready. Whoooooaaaaa. Pass me the entire pan and a cup of coffee. Coffee is most definitely a requirement! That or a giant glass of ice cold milk! Thanks for stopping by, Rachel! It’s sooooo good, June! Thanks so much for stopping by! What flavor of pudding mix did you use? My family LOVES eclair cake and peanut butter. Thanks for this recipe-it will be a fun surprise after dinner one night this week! Sorry-I misread. I now see that you used vanilla. This looks delicious! Could you use regular whipped cream instead of cool whip? I haven’t tried to use regular whipped cream, so I am not how stable it will be in this recipe. If you are not a fan of Cool Whip, I’d recommend trying Truwip, or googling Homemade Cool Whip. I hope this helps! I am one of those peanut butter lovers and made eclair style I can’t imagine anything much better. In spite of how much I adore the mint color on your website, it is VERY hard to see. Just an observation but maybe something you want to consider tweaking. Love the recipes, thanks! 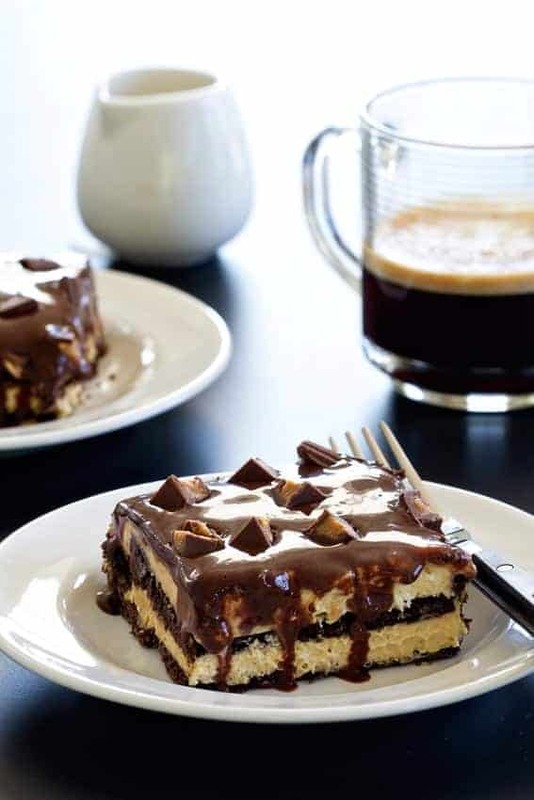 OMG this must really be of the best entertain cakes, love the éclair cake and making a peanut butter cup version is perfect! Do you make the pudding or just pour the packages in? You use the dry pudding mix. I hope this helps. Ok you should have seen my jaw drop when I saw that first picture. I can imagine myself taking a spoonfull of this cake right now. Looks so creamy and chocolatey. Love this! Thanks for yummy recipe. I would like to try it but do you have any substitute for instant Jell-o Vanilla Pudding Mix? Hi, Ayu! I can’t think of a substitute for instant vanilla pudding mix offhand, but here’s a recipe for a homemade version: http://www.browneyedbaker.com/diy-homemade-instant-vanilla-pudding-mix/. Good luck! Hi, Samantha! I think you should give the whipped chocolate ganache a go! Let me know how it turns out! Which part of this makes it an éclair? Real éclairs are made with Choux pastry not Graham crackers. It looks lovely but the name mis-represents it. 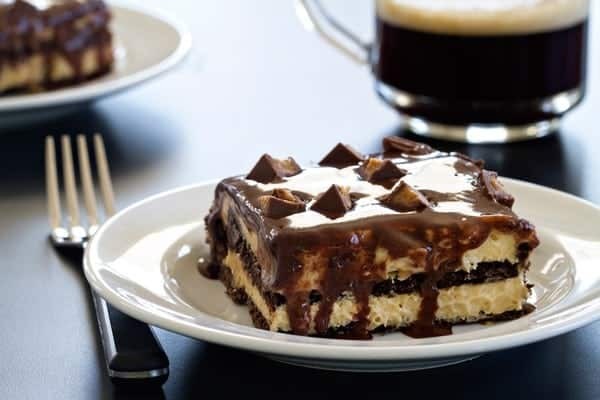 There’s a quick “cake” called Eclair Cake that is made with pudding, graham crackers, and has a chocolate frosting. Presumably the cake was named “eclair” cake due to the flavor combination. This is simply a peanut butter version of that ice box-style cake. Hi. My family loves this dessert. The only problem is that both times I have made it the pudding never firmed up, it stayed very runny. Followed instructions exactly. Any suggestions? Hi, Annette! I’m so glad your family enjoys the cake! When you beat together the pudding mixes and milk, just make sure you beat for a full three minutes until thickened (it can actually seem like a long time!). Fold in the whipped topping gently so the thickened consistency remains. Let me know how it goes! Do you think cheesecake flavored pudding would taste good ? Hi, Kerri! I’ve never tried it, but it sounds amazing! Let me know what you think!